LightKulture.com a leading on-line retailer is pleased to offer IN-EI, an extraordinary collaboration of Issey Miyake and Artemide. With all your senses, you know you have selected a lighting work of art. lightkulture.com is pleased to offer IN-EI, designed by Issey Miyake in collaboration with Artemide. “We are happy to partner with Artemide for the launch of Issey Miyake’s new IN-EI collection” noted Susan Inderbinen President of LightKulture.com. The name IN-EI comes from the Japanese language, meaning shadow, a nuance of shade and light. The partnership of Artemide’s lighting expertise with Issey Miyake’s innovative approach to materials and design, has resulted in a collection of free standing floor lamps, table lamps and pendants. In collaboration with Artemide’s mission and philosophy of The Human Light, similar values and visions can be seen from Miyake’s Reality Lab. There, innovation is derived from the intersection of creativity and mathematics. Miyake’s original garment project started with a single piece of folded flat cloth, which then takes on 3D shapes. Miyake’s technique, known as 132 5, has stretched beyond clothing, a natural extension of the process was lighting. Constructed out of specially treated recycled material, with the unique ability to diffuse light, these fixtures maintain their shape without the need for an internal frame. Each lampshade is developed using 2 or 3D mathematic principles, whereby light and shade alternate harmoniously. Issey Miyake’s unique folding technology creates playful forms, while Artemide illuminates these statuesque shapes using LED’s. The innovative meaning of Issey Miyake’s 132 5 theorem is found in the numbers. One unique piece of fabric is the foundation for each design. Three stands for tri-dimensionality. Two refers the same piece of fabric that can start to take on one shape, but revert back to its original shape. Five refers to the metamorphosis of turning folded shapes into clothing or objects. The recycled fibers of the shades actually helps reduce the energy consumption and CO2 emissions by 40%.The end result is truly brilliant. For more information go to Artemide http://www.lightkulture.com/m-3-artemide.aspx. “We are very honored to have been chosen by Artemide to offer Issey Miyake’s IN-EI collection. This is truly one of the most ingenious, functional lighting works of art I have ever seen. When combined with the quality, technology and reputation of Artemide, this collection represents a stunning interpretation of the art-and-science of lighting combined. The finished product draws you in to want to explore the shapes and shadows. I see something different is each one, every time I look at them. For many dining rooms or breakfast areas, the 24” diameter Fukurou is a perfect size. For tall entryways or loft areas, the Minomushi is a beautiful way to fill a space and add a bit of fascination. These are subtle statement pieces that draw your eye and stimulate your mind, but are not overpowering. The fixtures arrive flat in their carton, as if to emerge from a cocoon to suddenly morph into a beautiful sculpture. With all your senses, you know you have selected a lighting work of art”, noted Susan. 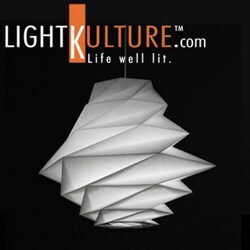 At LightKulture.com our mission is to offer the finest energy efficient contemporary lighting and light fixtures from around the world. We have assembled an exciting collection of the industries most innovative decorative and architectural lighting. We are proud to offer lighting solutions for both your home and work-life environments. Simplicity in design is complicated, function makes it last. Be inspired by our range of essential designs from well respected American and European manufacturers. In today’s world, energy efficient lighting is as important as eco-friendly or green lighting fixtures, such as LED or CFL lighting. We offer the very best energy efficient lighting and light fixtures, both high value LED lighting fixtures and CFL lighting fixtures in modern and contemporary styles that provide quality, innovation and authenticity.